What the heck does a transmission in a vehicle do anyway? What's all the hubbub concerning its function and maintenance? Both of these are valid questions and by the end of this article you'll have a much clearer understanding. The simplest comparison is to a gear shifter on any multi-speed bicycle, where the drive chain is moved from one gear to the next depending on where you are in the ride. In the case of the bike, you are the engine and when you need to you very temporarily disengage the drive chain to shift it to a desired gear. In a manual transmission car, depressing the clutch accomplishes the same thing. It disconnects the engine and transmission to allow for a smooth, desired gear change. In an automatic transmission, a torque converter senses the need to make the required and appropriate gear shift and does it for you, automatically. All moving parts require lubrication and a transmission, be it a vehicle transmission or industrial transmissions, are no different in this regard. The Fluid flowing through the vehicle's transmission is the lube and in the case of an automatic transmission it also serves as a system coolant and viscous fluid to facilitates transmitting power from the engine to the transmission. There are differing types of lubes for this application. In manual transmissions regular motor oil, heavyweight gear oil, or even automatic transmission fluid may be called for. Interestingly enough, automatic transmissions use automatic transmission fluid. Do check your owners manual to verify. Why change the fluid at all? Well, in the case of a manual transmission, the problem really isn't primarily the degradation of the lubricant itself, but contamination as a result of wear and tear over time that the internal components of any transmission experiences. This wear manifests itself as metal particles in the lube from gears, bearings, and synchronizers as they wear over time. We all know that any lubricant with such contaminants presents a problem over the life of the transmission. For automatic transmissions, along with contamination, fluid degradation is an issue as this type of transmission generates much more heat breaking the lubricant down with use. Frequent stop and go urban driving, trailer towing and just hauling heavy loads contribute to the degradation of this lubricant. In other words, hard usage, wears it out, just as it will any other vital automotive lube for moving parts. In essence, if you don't change this vitally important lubricant, metal shavings, other contaminants, and heat over time will shorten the life of your unit. Consider this both preventative maintenance and a good investment. So what's the recommended schedule, or just a simple good guide, for maintaining my investment? Great question. The quick answer is to consult the owner's manual and read what your manufacturer recommends. Typically for automatic transmission, a 100,000 mile fluid change interval is common. Some modern transmissions have a recommended 150,000 mile interval for this maintenance. Manual and industrial transmissions should be looked at on a case by case basis. If you talk to most mechanics, they tend to say that the recommended intervals are too long and every 50,000 miles should be the fluid change interval. OK, you've decided that scheduled, routine maintenance of your transmission and changing its lubricant is indeed important tasking. So what, in general, are the steps to accomplishing this job? Reference your owner's manual for the necessary quantity of replacement fluid needed or obtain a bulk supply from any of a wide variety of transmission fluid distributors. Your local parts store can supply the filter kit, gaskets, and any other supplies for this job. Idle the engine for a bit then take a short drive to run through all of the gears. Be safe on this step and ensure that the vehicle is both level and stable. Leaks may indicate another problem, so a visual inspection is always a prudent measure. The drain plugs are usually very accessible, but in some instances the oil pan may need to be removed in order to properly drain the transmission. A suction pump may be required to remove the fluid out of the filling point. Check the vehicle's shop manual for the proper, recommended procedure. Safety, again, is a priority, so be sure to be mindful of the hot fluid coming out as you drain the system. Position the drain pan to catch the old fluid, then remove the drain plug, or remove the oil pan bolts, as required, and let the old fluid drain. This step will reveal if there is a serious problem that should be addressed by a transmission specialist, such as metal particles or other other internal parts and pieces of the transmission. Try not to use any sharp objects or tools which may cause surface damage. Be sure not to leave any foreign particles in the pan when you perform this step. Be sure to wipe down the transmission to remove the last dregs of old fluid. Again, do not leave any foreign particles behind as a result of this cleaning. Any paper or fabric filter must be changed. Metal filters can be cleaned with a solvent and reinstalled. Use the specified sealant, as required, and tighten the pan bolts in a criss-cross pattern applying the specified torque. Clean it first, then put it back in. Use the correct type and quantity of fluid. DO NOT OVERFILL. Fill to the COLD level, checking with the dipstick during the fill process. This would be the point where you would want to add transmission fluid additive BEFORE filling to the cold level. Start the motor, apply the brakes and gently shift through all the gears. After placing the shifter in Neutral or Park, recheck the fluid level and adjust as required. Again, DO NOT OVERFILL. That's it. 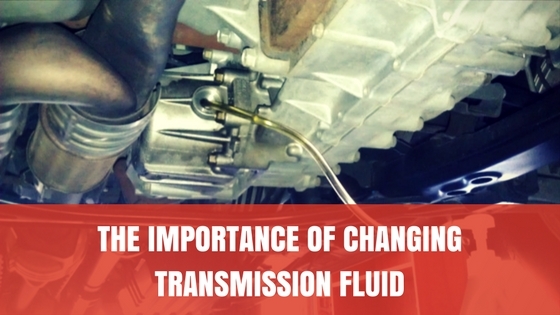 You now know some transmission basics and the importance of changing the transmission fluid. If you still have questions, a transmission specialist or any of the many transmission fluid distributors would be happy to answer up. You'll be told that periodically changing this core lubricant is a smart investment. Safe driving!